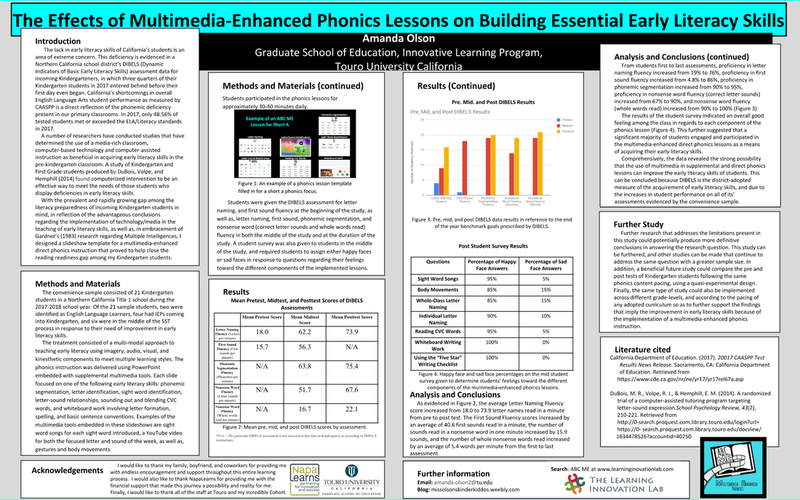 This mixed method study examined the effectiveness of systematic and explicit phonics instruction taught with a multimedia approach so as to meet the needs of the multiple learning styles of all students. The study involved a pre-experimental design using a one-group pretest-posttest. The treatment consisted of a multi-modal approach to teaching early literacy with slide shows, imagery, audio, visual, kinesthetic, multiple learning styles approaches coordinated with the adopted school reading program, Treasures (MacMillan/McGraw-Hill, 2007). Each day literacy instruction began with a multimedia interactive introduction to the regular literacy instruction. During this introductory activity, students had the opportunity to experience new language in a variety of integrated ways, including sounds, music, body movements, imagery, and videos. The phonics instruction was delivered using PowerPoint embedded with supplemental multimedia tools. The first slide focused on phonemic segmentation, the second and third on letter identification, the fourth on sight word identification, the fifth on letter-sound relationships, the sixth on sounding out and blending CVC words, and the eighth on whiteboard work involving letter formation, spelling, and basic sentence conventions. Examples of the multimedia tools embedded in these slideshows are sight word songs for each sight word introduced, a YouTube video for both the focused letter and sound of the week, as well as, gestures and body movements associated with each sight word, letter and sound that correlate to the sight word song and letter cards that accompany the district-adopted Language Arts program. In addition, each slide in the slideshow had a specific clip art or image embedded, along with an introductory gesture and saying, in order for students to be able to recognize the specific skill that each particular page was focusing on. For example, the slide that focused on sight words had an image of a hand snapping its fingers, and the class and teacher/researcher chanted/gestured the saying, “Sight words are words we know quick as a snap!” Students participated in these systematic multimedia phonics lessons for approximately 30-40 minutes a day, everyday for two weeks. At the conclusion of the two weeks, students were given the DIBELS Next assessment for LNF (Letter Naming Fluency) and FSF (First Sound Fluency) once more. At this time, qualitative data collection also took place in the form of a student survey. Students were asked to assign either happy faces or sad faces in response to questions regarding their feelings toward seven different components of the implemented lessons: sight word songs, body movements, whole-class letter naming, individual letter naming, reading CVC words, whiteboard work, and the use of an editing checklist for sentence writing. You can access the bank template for this phonics lesson in the "Learn More" section. A list of song and video resources to embed into your phonics lessons can be found on the "References" page. At the beginning of the year, students were given the district-adopted DIBELS Next assessment, in which they were given two one-minute timed tests. The first test asked students to read as many letter names as they could in one minute from a mixed list of random capital and lowercase letters. The qualitative data in this study was a student survey given at the duration of the study. Fourteen students, or 70%, scored far below the proficient score of 29 for LNF thereby requiring intensive support. Seven, or 35%, of the students performed at the proficient level for LNF. The second test, assessed students’ first sound fluency, in which they were asked to verbalize the first sound in a word read aloud by myself. For example, when I read aloud the word, “moon” they needed to say the /m/ sound. Ten, or 50%, of the students scored far below proficiency in FSF, thereby requiring intensive support. Two, or 10%, of students received scores below proficiency, thereby requiring strategic support in LNF. Nine, or 45%, of the students performed at the proficient level for FSF, resulting in the need of core support. On the midtest, four students, or 20%, of the students, scored below the proficient score of 29 for the beginning assessment period for LNF as compared to 70% in the pretest. 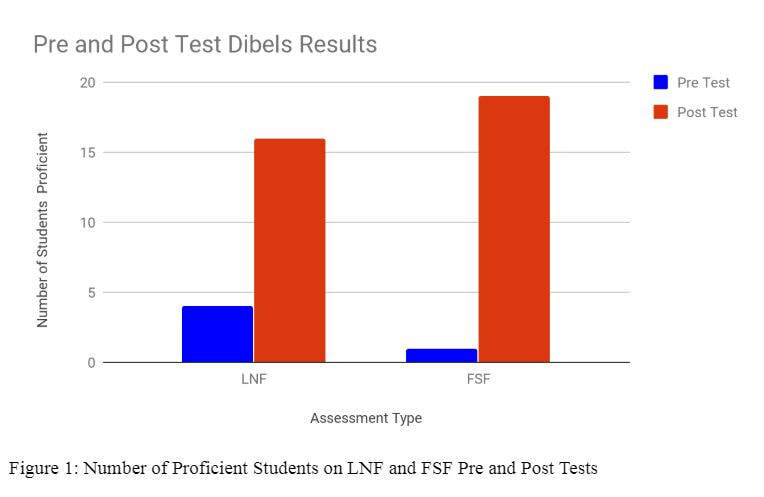 Sixteen students, or 80% of the students, performed at the proficient level on the midtest for LNF as compared to 35% in the pretest. In regards to FSF, one student, or 5% of the students, scored far below and below the beginning period proficiency goal on the midtest as compared to 50% in the pretest. Nineteen students, or 95% of the students, performed at the proficient level on the midtest as compared to 45% in the pretest. Both the LNF and FSF midtest scores show an increase in comparison to the pretest scores. The LNF scores gained an overall 45% increase in the number of students at the proficiency level from the pretest to the midtest. In comparison, the FSF scores gained an overall increase of 50% in the number of students at the proficiency level from the pretest to the midtest. This presentation was created in my first of three semesters in the Innovative Learning Program, and therefore only presents the pre and mid data, but not the post data. In addition, the video is a reflection of the presentation skills I had acquired up to that point. You will notice a drastic difference in overall presentation from this video and the others throughout this website, in ways such as the images, and pacing used.